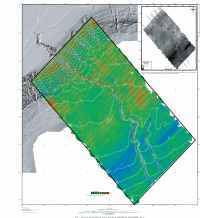 These maps show the sea floor topography and backscatter intensity of the Hudson Canyon region on the continental slope and rise offshore of New Jersey and New York (fig. 1 and fig. 2). Sheet 1 shows sea floor topography as shaded relief. Sheet 2 shows sea floor topography as shaded relief with backscatter intensity superimposed in color. 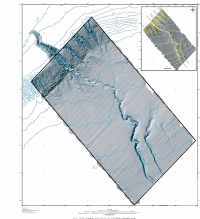 Both sheets are at a scale of 1:300,000 and also show smoothed topographic contours at selected intervals. 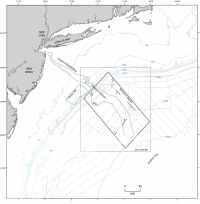 The maps are based on new multibeam echo-sounder data collected on an 18-day cruise carried out aboard the National Oceanic and Atmospheric Administration (NOAA) Ship Ronald H. Brown during August and September 2002. 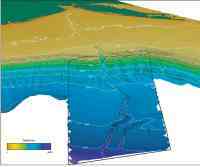 Additional multibeam data of the Hudson Canyon collected by the Woods Hole Oceanographic Institution (WHOI), on the continental shelf collected by the STRATAFORM project (Goff and others, 1999), and a survey of the Hudson Shelf Valley (Butman and others, 2003), and a compilation of bathymetric data from the National Geophysical Data Center (NGDC) Coastal Relief Model provide coverage of areas surrounding Hudson Canyon (fig. 2). Interpretations of the surficial geology also utilize widely spaced 3.5- and 10-kiloHertz (kHz) high-resolution seismic profiles collected by the U.S. Geological Survey (fig.2). Click on the following figures for larger images in PDF format. Map Sheet 1 -- Map only. Sea floor topography as shaded relief. Map Sheet 2 -- Map only. Sea floor topography as shaded relief with backscatter intensity superimposed in color. Figure 1. Perspective view, looking toward the northwest, of a portion of the continental shelf. Figure 2. Map showing the location of the Hudson Canyon on the continental slope.